2 years annual fee waiver. Convert your Rewards Points to offset your Prudential insurance premium payments. 24-hour concierge helps you with travel arrangements, reservations, shopping and gift services. Earn Rewards Points for every $1 charged to your credit card. Contribute to your alma mater when you spend on your credit card. 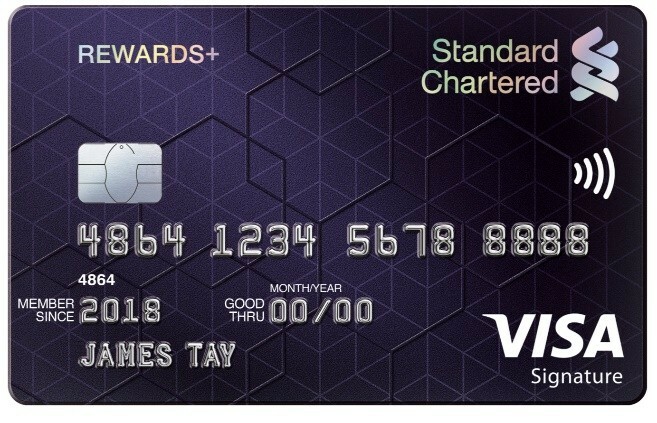 The Standard Chartered Rewards+ Credit Card (“Rewards+ Card”) allows you (“Rewards+ Cardholder”) to earn Rewards Points when you (including your supplementary cardholder(s) on your Rewards+ Card account) charge eligible retail transactions (“Qualifying Rewards+ Card Transactions”) (refer to transaction exclusions below) to the Rewards+ Card. 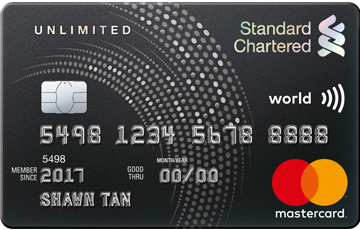 Rewards+ Cardholders will, under the Standard Chartered 360° Rewards programme, be eligible to earn one (1) Reward Point for every S$1 (or its equivalent for spends that are not made in Singapore Dollars, where relevant) spent with the Rewards+ Card. Under the Rewards+ Card Promotion, Rewards+ Cardholders will be eligible to earn up to (A) nine (9) additional Rewards Points for every S$1 spent in foreign currency (which are spends that are not made in Singapore Dollars) on Qualifying Rewards+ Card Transactions and (B) up to four (4) additional Rewards Points for every S$1 spent in Singapore Dollars on Qualifying Dining Transactions. “Qualifying Dining Transactions” are dining spends that are Qualifying Rewards+ Card Transactions and are charged to the Rewards+ Card made at dining establishments in Singapore and overseas classified under the Merchant Category Codes (“MCCs”) of Restaurants and eating places (5811/5812), Fast Food Restaurants (5814) and Pubs & Bars (5813). For avoidance of doubt, purchases from establishments including but not limited to local hotel restaurants (including wedding banquets), bakeries, supermarkets and catering companies that are not under the MCCs stated above will not be considered as Qualifying Dining Transactions for this Promotion. There is a cap of 20,000 Rewards Points (“Rewards+ Cap”) per year on the additional Rewards Points awarded. “Year” for purposes of this Rewards+ Card Promotion means the time period from the Rewards+ Card approval date (or a particular anniversary of such approval date) to the day falling before the next anniversary of such approval date. The Rewards+ Cap will be reset every anniversary of the approval date of the relevant Rewards+ Card in question. The following transactions are not Qualifying Rewards+ Card Transactions and will not earn any Rewards Points: a) any cash advance; b) any fees and charges (including but not limited to annual card fees, service fees, interest charges, cheque processing fees, administrative fees, finance charges, and/or late payment charges and other miscellaneous fees and charges) charged to your Rewards+ Card; c) any Credit Card Funds Transfer; d) any monthly instalment of an EasyPay transaction; e) any amount charged to your Rewards+ Card (and/or your supplementary credit card) that is subsequently cancelled, voided, refunded or reversed; f) recurring payments or payments made to all billing organisations using Standard Chartered Online Banking; g) AXS or ATM transactions made using the Rewards+ Card; h) amounts which have been rolled over from the preceding months’ statements; i) tax refunds credited into your Rewards+ Card account (and/or your supplementary Rewards+ Card account); j) any tax payments charged to your Card (and/or your supplementary credit card); k) any insurance premiums charged to your Rewards+ Card (and/or your supplementary Rewards+ Card); and l) any top-ups or payment of funds to any prepaid cards and any prepaid accounts including without limitation to the following accounts or any other accounts as we may specify from time to time: EZ LINK PTE LTD, EZ LINK PTE LTD (FEVO), EZ-LINK PTE LTD SINGAPORE, EZ-LINK TOP-UP KIOSK, EZ-LINK (IMAGINE CARD), EZLINK*, EZ LINK, EZLINKS.COM, FLASHPAY ATU, TRANSITLINK*, TRANSIT LINK*, TRANSIT LINK PL, TRANSIT, MB* MONEYBOOKERS.COM, WWW.IGMARKETS.COM.SG, OANDAASIAPA, OANDA ASIA PAC, PAYPAL * BIZCONSULTA, PAYPAL * OANDAASIAPA, PAYPAY * CAPITALROYA, Saxo Cap Mkts Pte Ltd and SKR*SKRILL.COM m) any other charge, fee, transaction or payment as we may stipulate from time to time. The Standard Chartered 360° Rewards Programme terms and conditions also apply. 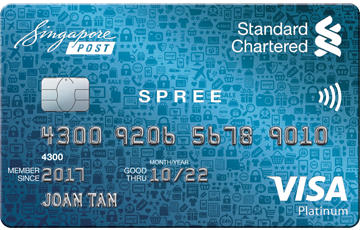 Visit sc.com/sg/rewardsplustncs for the full Standard Chartered Rewards+ Card Promotion Terms and Conditions that apply. To be eligible for the various promotions listed under the Rewards+ Merchant Promotion, you must hold a valid Rewards+ Card and full payment must be made with the Standard Chartered Rewards+ Credit Card (“Rewards+ Card”). Privileges are not exchangeable for cash or other items and cannot be used in conjunction with any other discounts, privileges, promotions, discount schemes, loyalty programmes, discount cards or vouchers, unless otherwise stated. Privileges are not valid on eve and on Public Holidays and other special occasions, unless otherwise stated. Privileges are subject to the individual merchant´s terms and conditions. Please check with the relevant merchant or outlet concerned. Standard Chartered Bank (Singapore) Limited is not an agent of the merchant and makes no representation as to the quality of goods and services provided. Any dispute about quality or performance of the product and/or service is to be resolved directly with the merchant. The Bank and the respective merchants reserve the right to vary their terms and conditions governing the promotion without prior notice. In the case of a dispute, the decision of Standard Chartered Bank (Singapore) Limited on all matters shall be final. Visit sc.com/sg/rewardsplusmtncs for the full Rewards+ Merchant Promotion Terms and Conditions that apply. Valid from 1 May 2018 to 31 March 2019 for the first 1,500 redemptions only. Under this Rewards+ Cathay Movie Promotion, Rewards+ Cardholders will be entitled to a complimentary Cathay Cineplex Platinum Movie Suites Ticket for every equivalent Cathay Cineplex Platinum Movie Suites Ticket purchased. Purchase of Cathay Cineplex Platinum Movie Suites Ticket must be performed over the counter at Cathay Cineplex Ticketing Counters. The Rewards+ Cathay Movie Promotion is valid for up to 5 daily complimentary redemptions per Rewards+ Cardholder. Rewards+ Cathay Movie Promotion Terms and Conditions apply. Valid from 1 May 2018 to 31 March 2019 (“Rewards+ Fullerton Dining Promotion Period”). Under this Rewards+ Fullerton Dining Promotion, Rewards+ Cardholders may enjoy up to 50% off a la carte food items and selected buffets such as the International Buffet Lunch at the Town Restaurant which is available from Monday to Friday; Brimming Buffet Dinner at the Town Restaurant which is available daily; Indian Curry Lunch Buffet at The Courtyard Restaurant which is available Monday to Friday; Afternoon Tea Buffet at The Courtyard Restaurant which is available daily; Chocolate Buffet at The Courtyard Restaurant which is available on Friday and Saturday, which excludes set menus, promotional menus, buffet which are not listed per above, drinks, banquet, catering, takeaway, private dining, service charge and GST (“A La Carte Food Items”) at all 9 participating dining establishments of The Fullerton Hotel & The Fullerton Bay Hotel Singapore. The amount of discount the Dining Party will enjoy depends on the number of Guests contained in such Dining Party. “Guests” refers to the Rewards+ Cardholder and the Rewards+ Cardholder’s dining companions that are 7 years of age and above, that each order at least 1 A La Carte Food Item. If the Dining Party contains 2 Guests, a 50% discount will apply to the total bill. In the event that there are more than 8 persons, the 15% discount will apply to the 8 A La Carte Food items with the highest value in the total bill. The discount available on the A La Carte Food items ordered by members of a Dining Party is applicable on a maximum of 8 A La Carte Food Items if the Dining Party comprises 9 or more Guests. For the avoidance of doubt, the Rewards+ Cardholder and his/her guest(s) must each order at least 1 A La Carte Food Item to participate in the Rewards+ Fullerton Dining Promotion. If this is not done, the maximum discount extended to the Rewards+ Cardholder and up to 7 of his/her guest(s) will be capped at 15%, subject always to there being no further discount on A La Carte Food Items other than the 8 A La Carte Food Items with the highest value. The Rewards+ Fullerton Dining Promotion is not valid on the eve of public holidays, on public holidays themselves and other blackout dates as determined by the merchant, including but not limited to the 15 days of Chinese New Year, Valentine’s Day, Easter Weekend, Mother’s Day, Father’s Day, F1 Weekend and Thanksgiving, unless stated otherwise. Only 1 Rewards+ Card is to be used for every bill and the Rewards+ Cardholder must be 1 of the diners for that particular restaurant bill to participate in the Rewards+ Fullerton Dining Promotion. Menus, prices, change of concept, participating outlets and operating hours are subject to changes during the Rewards+ Fullerton Dining Promotion Period. The Reward+ Fullerton Dining Promotion is not applicable with other discounts or promotions run by The Fullerton Hotel Singapore and/or Fullerton Bay Hotel Singapore. Advance reservations are required during promotions run by The Fullerton Hotel Singapore and/or Fullerton Bay Hotel Singapore and high occupancy at restaurants at hotels may restrict seating availability. Children will be considered as a guest for the Rewards+ Fullerton Dining Promotion only if the child orders from the full priced adult a la carte menu. For the avoidance of doubt, meals ordered from the children’s menu as indicated and determined by the dining establishments of The Fullerton Hotel & The Fullerton Bay Hotel Singapore will not be eligible for the Rewards+ Fullerton Dining Promotion. The Fullerton Hotel Singapore and The Fullerton Bay Hotel Singapore may restrict seating availability at specific restaurants during high occupancy. An allocation will be made for Rewards+ Cardholders when required. Advance reservations quoting your status as a Rewards+ Cardholder will be required. Tables may not be available to Rewards+ Cardholders in selected restaurants in the event the allocation for Rewards+ Cardholders have been taken up on specific dates. The Rewards+ Fullerton Dining Promotion Terms and Conditions apply. 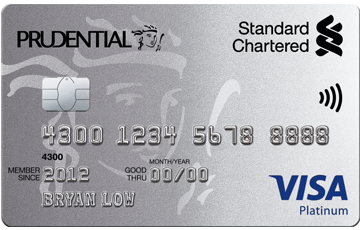 To be eligible for Digital Credit Cards Sign-Up Promotion (“Promotion”) available from 22 April to 30 June 2019 (both dates inclusive) (the “Promotion Period”), you must (a) apply for one of the Eligible Cards (as defined below) issued by Standard Chartered Bank (Singapore) Limited (“Bank”); (b) your application must be made online at www.sc.com/sg/credit-cards/ and within the Promotion Period; (c) Your Eligible Card application must be instantly approved by Standard Chartered, where such approval is provided immediately after submitting the application online (“Instant Approval”), and this approval is final and unconditional. In the event that your application is not approved instantly due to any reason, you will not be eligible for this Promotion; and (d) Upon Instant Approval, you must opt to activate your virtual credit card immediately on the same day (“Digital Credit Card”) online. The Digital Credit Card can be used without your physical credit card. If you satisfy all the eligibility criteria (a) to (d) above, you will be eligible to receive S$20 cashback (“Cashback”). The maximum aggregated amount of Cashback that an Eligible Cardholder may receive for this Promotion and all your subsequent credit card application(s) (where relevant) combined is capped at S$20. Visit here for details and the full Digital Credit Cards Sign-Up Promotion Terms and Conditions that apply. 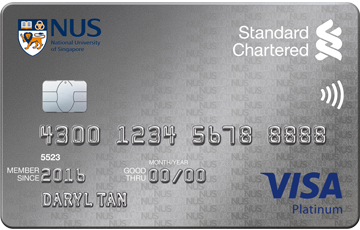 “Eligible Card” refers to Unlimited Cashback Credit Card, Rewards+ Credit Card, Spree Credit Card, NUS Alumni Platinum Credit Card, Prudential Platinum Credit Card, PruPrestige Visa Signature Credit Card and Visa Infinite Credit Card.